The MEZCOPH Research Poster Forum is a Student Coordinated event that provides a great opportunity for planning committee members and participants alike. Planning committee members gain valuable experience planning for and executing the Research Forum and it looks great on your resume or curriculum vitae. Research poster participants gain excellent experience presenting their research in a public forum. Graduate students have the opportunity to get expert feedback from faculty judges. Feedback is given to participants on the poster content, and on the student presentation of information. This amounts to an opportunity to practice presenting your Thesis or Dissertation in a less threatening environment than your oral defense. As public health professionals our work sits upon a foundation of research. Get involved! 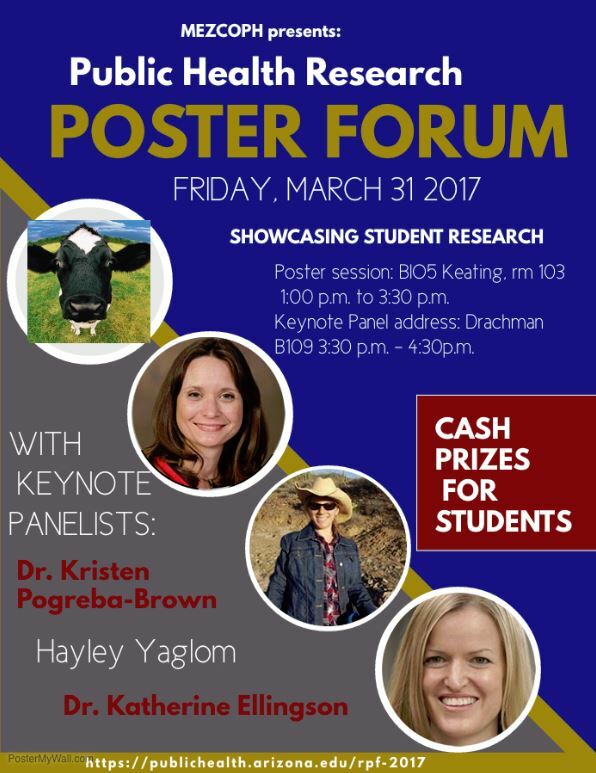 Come check out the MEZCOPH Research Poster Forum on Friday, March 31st from 1:00 to 3:15 in Bio 5/Keating Room 103. See the research projects your peers have been involved with, get ideas on how to present your research and consider becoming a planning committee member for next year or submitting your own research for presentation! And don’t forget to attend the Key Note Panel presentation on One Health at 3:30 in Drachman B-109. The panel will be followed by presentation of cash awards for the poster that demonstrates Best Example of Science in Service to Society, Best Poster Highlighting Original Research, and best Community Engagement poster. The event wraps up with a reception offering light snacks in the Drachman Hall Breezeway at 4:30. This provides current students an opportunity to interact with potential new students. We hope to see you all there! ← Swimming, Biking and Running, Oh My!